You could change the quantity of each order. Click on the quantity count and enter the quantity if you have a large amount of order. Discount can be given by percentage or by price. To apply discount that has been setup under discount, click on the "info" button. Price can be overwritten. However price cannot be overwritten with 0 price. For order that has not been sent to kitchen, you could still modify the modifier for this item. For order that is sold by weight, edit the weight and price will be recalculated based on the new weight. Remarks will be printed to the kitchen. 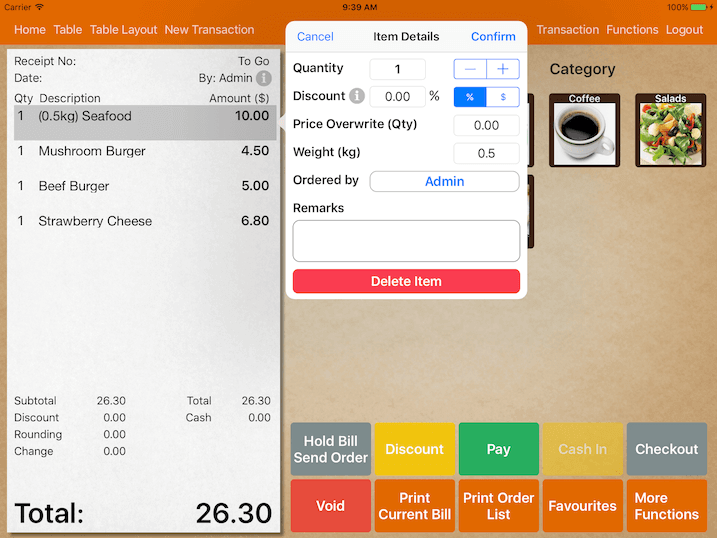 If configured, remarks can be printed under customer receipt and order list as well.